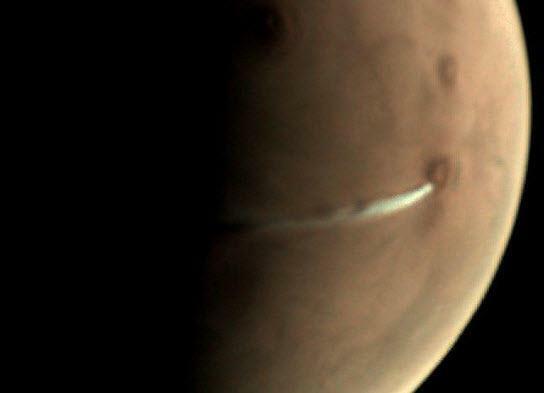 A “curious” plume-shaped cloud that appeared near Mars’s equator is growing and now casts a long trail from an alien volcano, Oct. 10 photographs from the European Space Agency (ESA) show. Photos from the ESA’s Mars Express Orbiter show a cloud extending from behind a massive Martian volcano named Arsia Mons. While the cloud, which could be “visible even to telescopes on Earth,” is hanging over the volcano, it is not being ejected from it despite its proximity, according to a Thursday ESA press release. “In spite of its location, this atmospheric feature is not linked to volcanic activity but is rather a water ice cloud driven by the influence of the volcano’s leeward slope on the air flow — something that scientists call an orographic or lee cloud — and a regular phenomenon in this region,” the ESA’s statement said. Mars’s cold, thin atmosphere is seasonally obscured by ice clouds, but scientists believe the summer’s major dust storm might have spurred on the creation of this cloud. Abnormal levels of dust in the atmosphere and Arsia Mons’s gigantic, 12-mile high profile worked together to form the abnormal whisp, scientists say.